… at the same time, I confess no small amount cynicism for my own country, whose leaders are utterly flabbergasted by the Egyptian revolution and can do little but sit by helplessly and watch circumstances unfold. This is nothing new, of course. It’s what happens when we purport to promote freedom and democracy while openly supporting tyrants. It’s what happens when we claim our Mideast foreign policy promotes “stability” when what we really seek to promote is our own national interests. Do we really, actually believe that citizens of the Arab world cannot tell the difference? the extent to which successive US administrations have consistently betrayed a lack of faith in the efficacy of America’s democratic creed, the extent to which the US government has denied the essentially moderating influence of democratic accountability to the people, whether in Algeria in 1992 or in Palestine in 2006. It’s sobering to consider: at the end of the day does our nation ultimately have true faith in democracy, or does our ultimate faith only lie in the expansion of our power and influence? Think I’m a blind optimist? Think I don’t understand how the real world works? Think it’s naive to suggest that the Arab world could actually be ready for democracy? Before you answer yes, just ask yourself how far arming dictatorial regimes has gotten us. 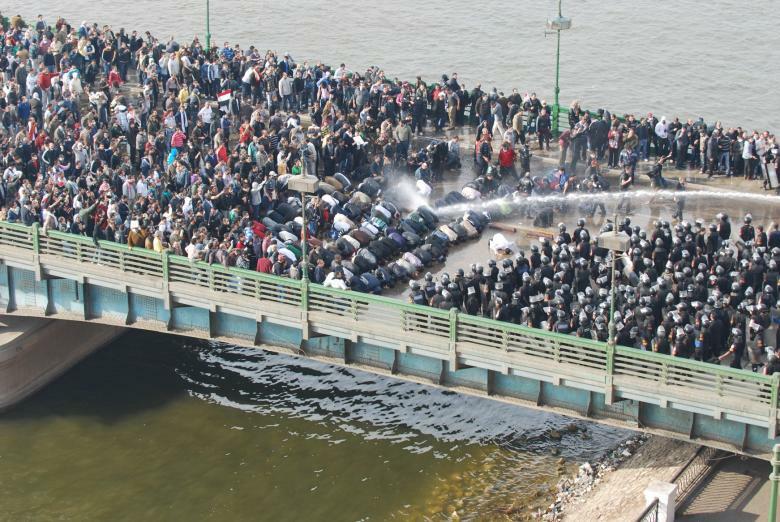 The Egyptian people are ready for democracy. The past two decades clearly proved that there are no nations that are not ripe for democracy. There are no peoples and no geographical regions whose culture, character and history is incommensurate with liberal, social democracy. President Barack Obama said so openly in his famous Cairo speech. His predecessor, George W. Bush, also encouraged democratization of the Arab world. Back then, few people lauded him, and even fewer understood his message. Now, after so much blood had already been spilled on Egypt’s streets, they already understand. This entry was posted in Egypt, Israel, Palestine, Politics on January 31, 2011 by Rabbi Brant Rosen. Makes me wonder what the rest of the world (Europe mostly I suppose) was doing when the fledgling leaders were trying to create a democracy on this side of the Atlantic ocean in the early 1700s. And how did we move from a democracy of the people to a country that supports oppressors?